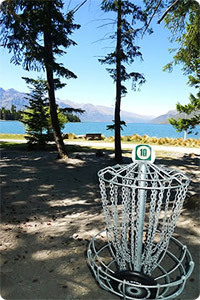 Disc golf has been played in and around the Wakatipu for decades, most notably in the Queenstown Gardens. The course in the Gardens was the first permanently marked out course in New Zealand. Starting out with 17 object targets and one lone basket back in 1996, it has grown over the years and has now become a full 18 basket tournament course. The Queenstown Disc Golf Club was established in 2010 to help maintain the course and develop the sport. The club puts on three annual tournaments, the Queenstown Classic/Paradise Plates, Winterfest Doubles and Tucker Beach Rush. In addition we have a social league and regular pick-up games at 3.30pm on Sundays. We encourage local golfers to join our ladder at Planet Sports, 23 Beach St, following which you may challenge other members at any time. On the first Sunday of every month, at 3.30pm, we have a trophy round. With a gold coin entry you can join us to play for the trophy, with the winner taking all. Non members are always welcome and encouraged to join in. We also welcome anyone who would like to contribute to the development of disc golf in the Wakatipu area. Please get in touch if you are interested.